“Bold Block – Celestial Bunny” was stamped in blue on vellum and trimmed with deckle scissors leaving enough vellum on both sides so that eyelets could be used to attach the vellum to the card. Strips of three different blue card stock were attached with glue, then the vellum cut-out was secured with eyelets. 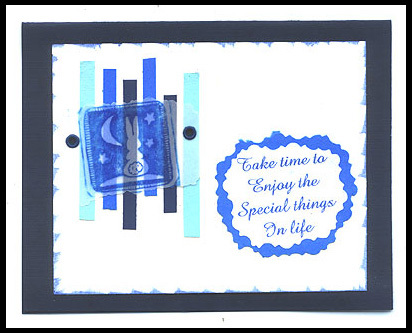 The saying, “Take time to enjoy the special things in life” was computer generated, trimmed with decorative scissors and layered over a blue piece of card stock cut just a little larger. The edge of the white card stock was edged with a blue marker and layered on dark blue card stock. Card by Judy Conklin.